The yellow metal fell close to 2% last week as the American Dollar, its biggest driver, picked up a haven bid last Monday and rose to a fresh 2018 highs. The greenback will likely extend the rally later this week, sending gold lower, if the Federal Reserve sounds less dovish than expected. Markets expect the central bank to hike rates by 0.25% and signal a wait-and-see approach for 2019. Gold, however, could rise well to new highs if the Fed hints a rate hike pause in 2019, sending the treasury yields and the greenback lower. Gold is currently recovering from a minor sell-off which has the trend line represented on the chart to be tested. 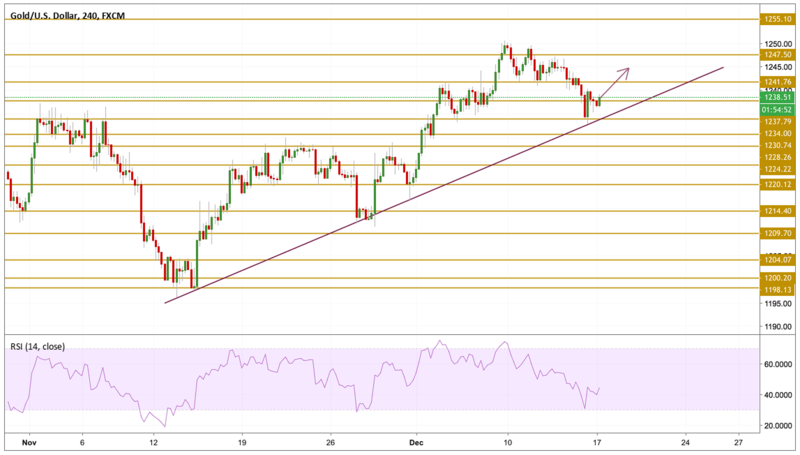 The price is hovering just above the $1237.79 support level with a rising momentum , that is why we can expect a small recovery that can emerge from here. The next level we will be focusing on is the $1245 level if the price manage to break above the $1241.76 level.